Mountain wrote: Things are progressing well by the look of it. Is a good idea to put insulated railjoiners in between both sets of crossover points. It makes sure there are no issues between the two controllers. Three sidings are a good idea. On the prototype the crossovers and the sidings would be trailing rather then facing (In other words trains would need to reverse over them which makes sure there is no possibility of a head on collision). 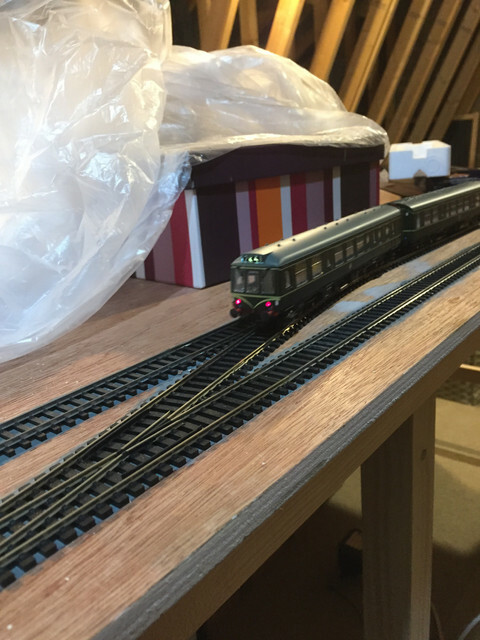 However with us modellers we dont need to worry about passenger safety so we can use the most convenient way. You will find that you will soon fill those sidings up and they will be most useful. Painting the board prior to fixing the track is an excellent idea. im hoping to run dcc and from what ive read i dont need rail joiners, unless ive got my wires crossed (pun not intended)? You are correct. Is just my DC auto wiring coming into play. (Though I tend to wire DCC as DC but add the links needed to make it all live) as by zoning it off, fault finding is easier in theory. It will work fine as DCC without it). I think I didnt read that right! I think he means he doesn't need insulating joiners. I think you need rail joiners! You may have heard about 'droppers' from the DCC bus, the intent being to bring electrical power to the track in many places, rather than just one connection at one point. This is a good idea, and should be implemented, especially on large layouts, but it is not the intent to supply power to EVERY piece of setrack. What Mountain meant, was that on a DC layout, if the two circles of track are isolated from each other (by means of replacing the joiners/fishplates with plastic insulating fishplates instead of metal ones between the points), then two separate controllers can be used to run the two circles independently (except when the points are switched to join them). 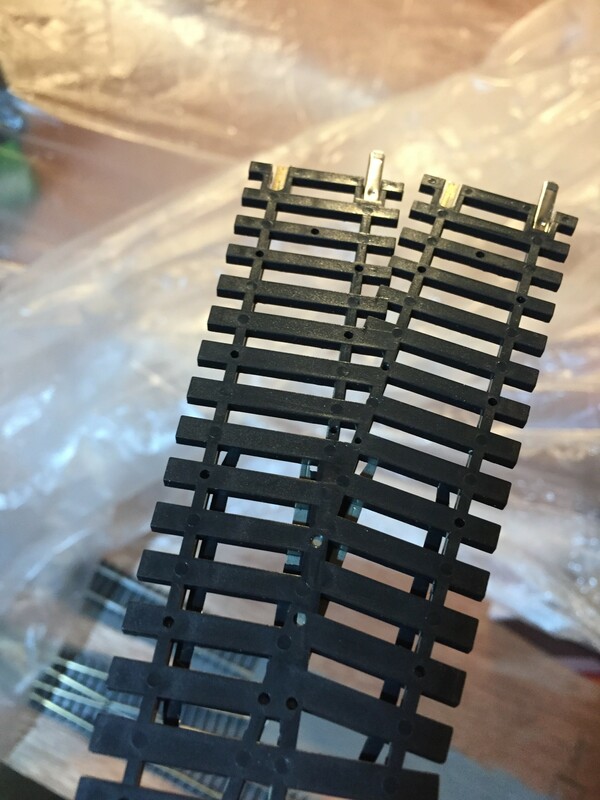 If you do not intend to ever run more than one controller on DC and intend to mostly run DCC, then the plastic insulators are not necessary, but I would still advocate doing it, as it will help with fault investigation if the two circles can be independently checked for diagnosis of shorts. thanks, that makes sense! i've drilled holes for the dropper wires to meet the track every 30 cm or so (less in some places), except for the sidings as i haven't gotten that far yet. in relation to wiring the points though, im a little lost. the frog in the points is insulated (i think), theyre just normal hornby points. do i need to wire a live feed to it? when looking at it there doesnt seem to be a way to wire it without causing a short via the train wheels unless im imagining it incorrectly. ive attached photos below where you can just make out the underside of the frog in the bottom image. i think that makes sense, thanks for that. 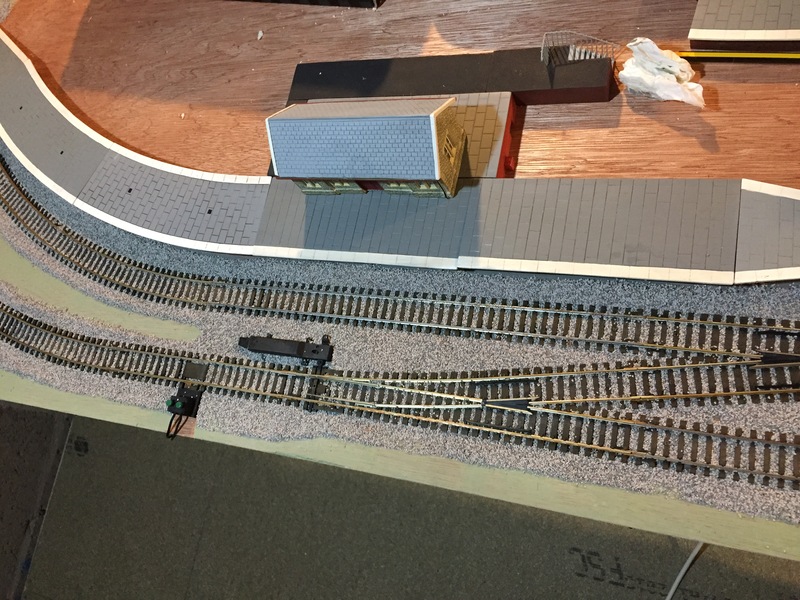 Im going to run dropper wires to each siding as well several as on the main lines to ensure that power is throughout the layout. Having tested the points last night without extra feeds to them I am not going to run dropper wires to the points. All functions well without them, and in fact as the dropper wires have not been made live yet, the whole layout was working flawlessly on only one feed. I realise not powering points may not be best practice but in an effort to 'Keep It Simple Stupid' I'd like to avoid unnecessary complications, if i ever want to run more power feeds to the track it shouldn't be too problematic although with the layout being relatively small I can't see me needing more than the few I already have. 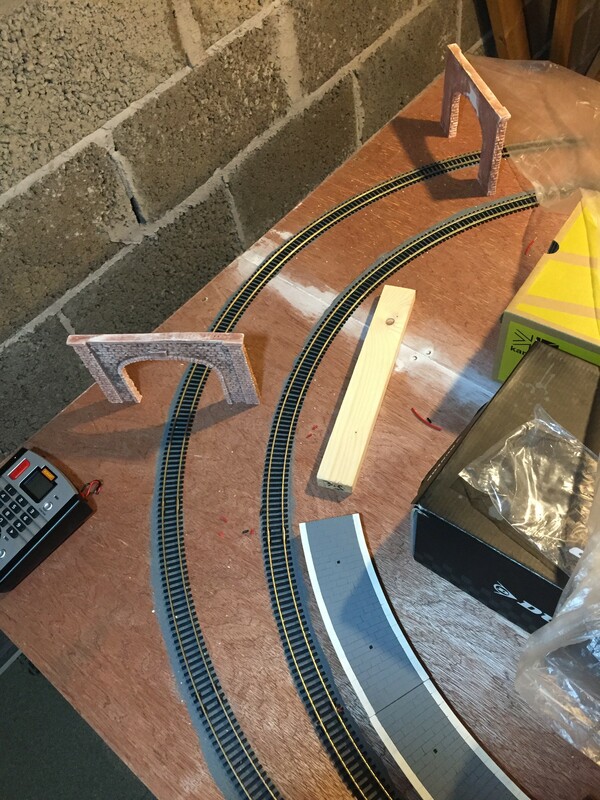 Hopefully I'll get some time over the Christmas break to finish laying the track and and then get some wiring done. I also got my Select back from Hornby, they have upgraded the firmware to v1.5 so now my loco's are under control, finally! A quick 2 minute run last night to check it was working soon took over half an hour of just running back and forward and playing with the directional lights. It's funny how time just disappears! Once upon a time it was all so easy, we had insulated frogs (all plastic like your photo), or live ones which were all metal. Now we have Hornby insulated ones, (your photo again) Peco insulated ones (the plastic bit is much smaller and a few locos have wheels wide enough to momentarily bridge them), all metal ones which are joined to both rails of the V and so need insulated joiners, and now in a case of finally doing, what was to quote Mr Fawlty, "the bleedin' obvious, Peco have produced an all metal point where the tip of the V is insulated and provided with a bit of wire that makes it possible to use in any configuration. And that's just the two main providers of track never mind the rest of the world. Well it's been a busy few days but managed to get a few hours here and there and now the track has finally all been tacked down and got the main bus and dropper wires fitted. Quite happy with myself and hoping that all is well with power etc. It was tested and all was fine prior to the last bits being pinned down so I would imagine the rest to be fine. The only issue I came across, and it wasn't something I had considered, was the overhang catching on the platform where they come off or on the points. Moving the platform back would cause an unrealistic gap to the solution will be to move the station position and have it run around the corner a little to give the platform some length. Once sorted I'm hoping to start to weather and ballast the track but that might be a little time away, we shall see how the holidays go! It’s been quite a while from I last made a large model but after getting into the swing I’ve now got an engine shed. It’s not just perfect but it’s getting there. Used a combination of humbrol, Vallejo and citadel paints. Nearly done! 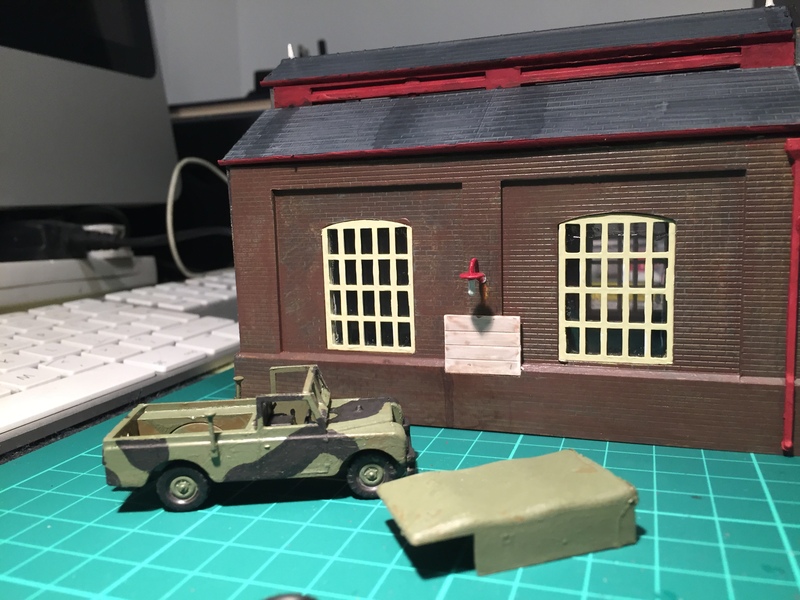 I’ve also an old army series 3 Land Rover somewhere in 1:76 that needs finished that I’ll use in the layout and after a run into Belfast I’ve also picked up a mk1 golf. 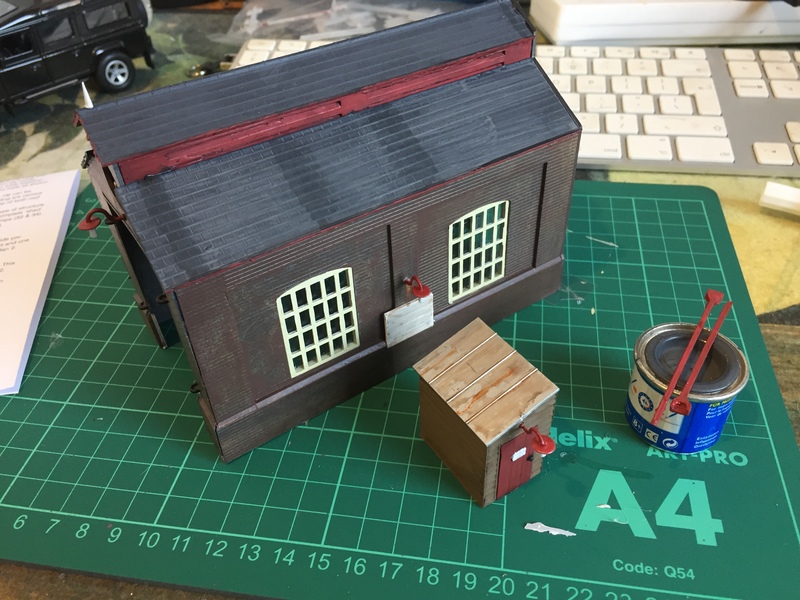 Ahh, the old Airfix engine shed, that was my first build when I came back to the hobby. You've done a great job on it too Chris, the lean to shed is particularly well detailed. You popped in to Belfast, nice to know someone else is on this side of the pond. I'm in Ballymena, where abouts are you? 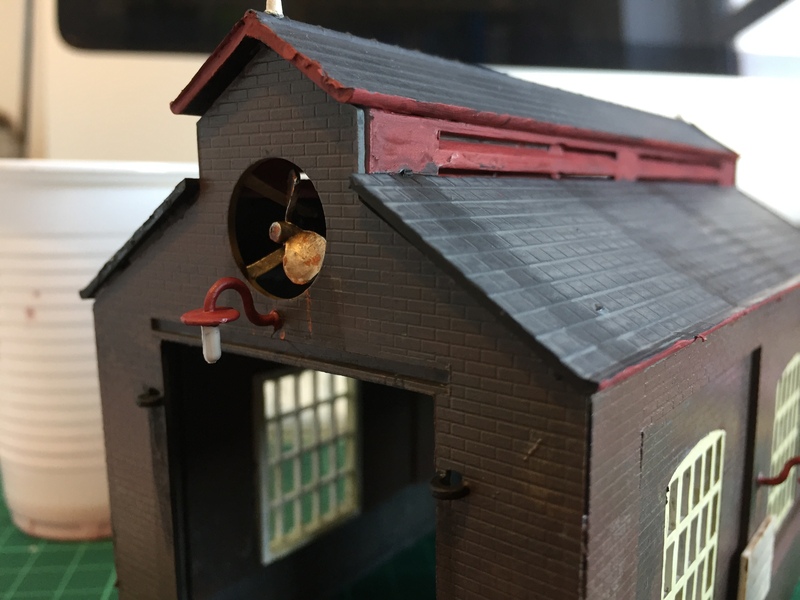 carnehan wrote: Ahh, the old Airfix engine shed, that was my first build when I came back to the hobby. 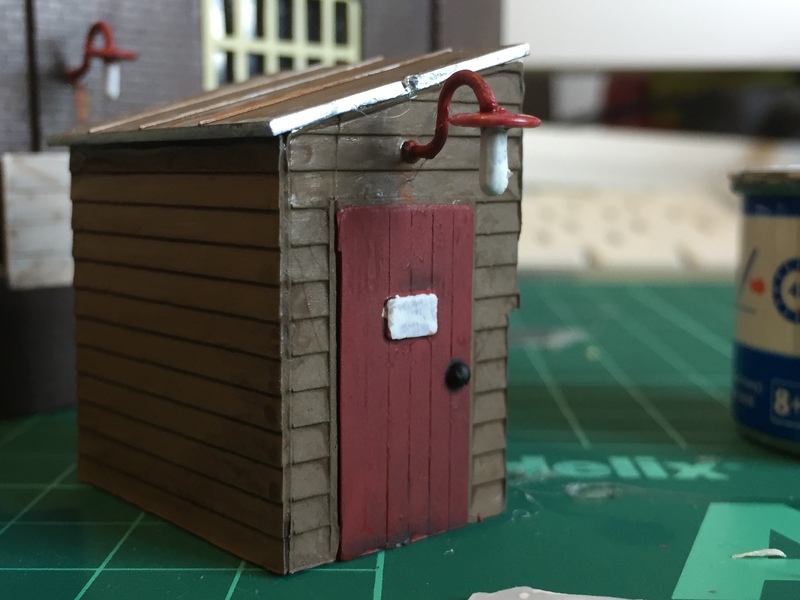 You've done a great job on it too Chris, the lean to shed is particularly well detailed. Thanks Paul, I’m only down the road in ballyclare, in fact was up in Ballymena earlier this morning for an hour. Found it and it would appear that its nearly finished. 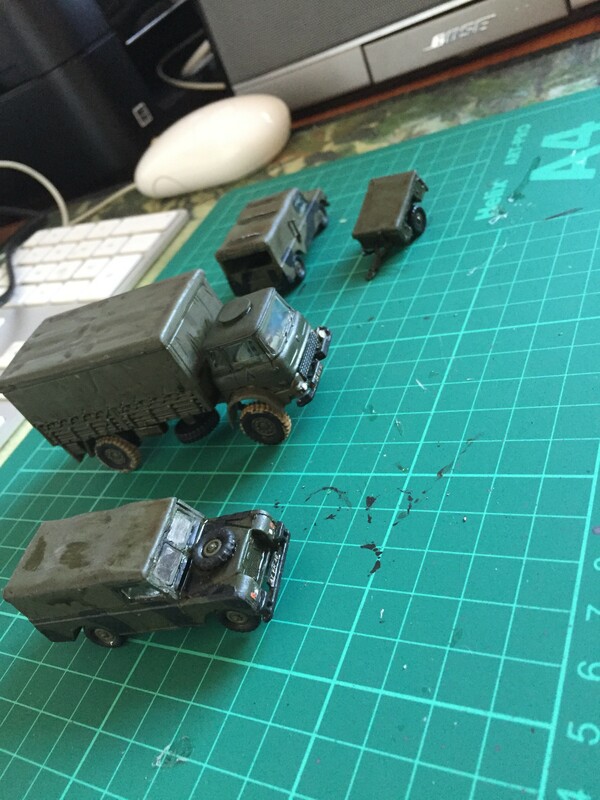 Ill need to get some more olive drab to do the Sankey trailer that comes with it the landy is nearly done. I've another completed one in a box somewhere along with a 4 ton Bedford. That aside, you can see here my solution to the rolling stock fouling on the platform. It now runs around the inside bend but it may soon be moving due to the tunnel location. 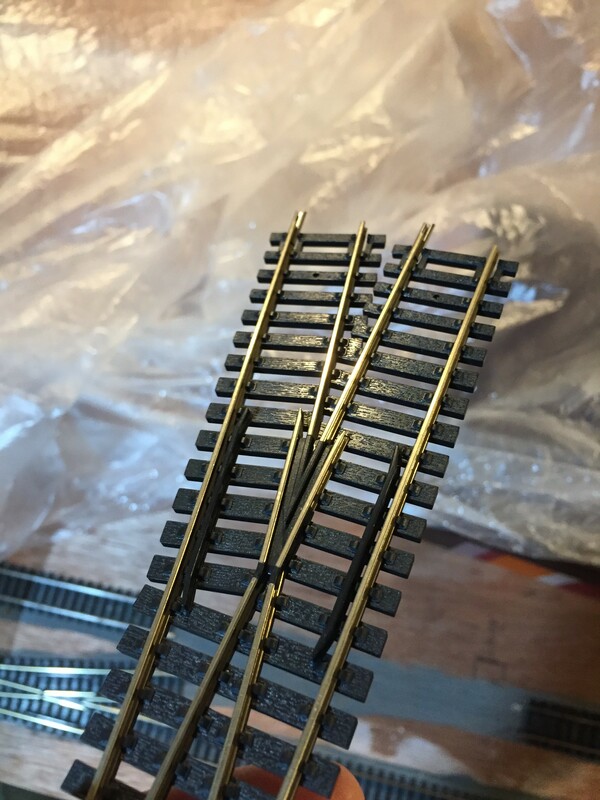 The ceramic ends I bought do not accomodate both lines when the longer 225 carriages are on a turn so the solution I've come up with is to move the tunnel to the other end of the layout where there is a larger gap between the two lines than at the other end. This way the tunnel will only cover one line. I'll need to get the tunnel roughly finished before I decide what to do with the station and platform. 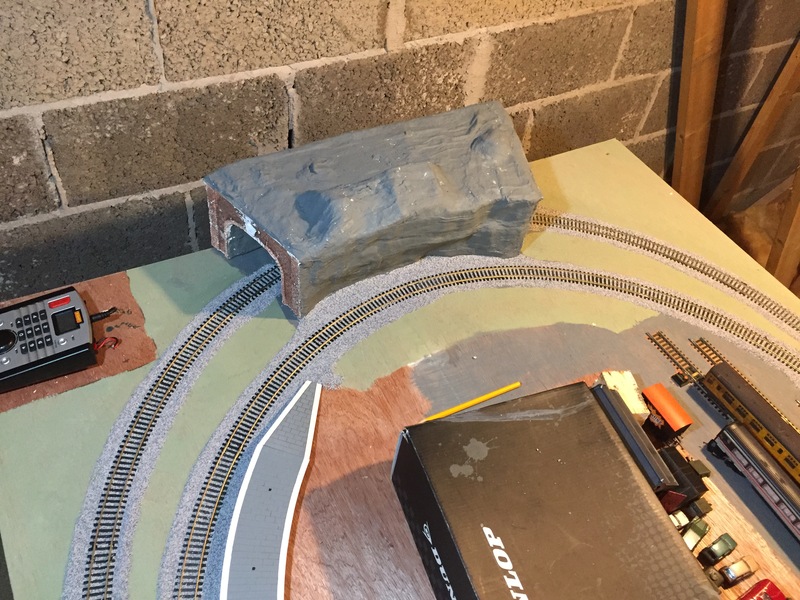 If it does move it will still need to run around the inside of the bend at the other side of the layout due to the siding location. In the photo below I've set a piece of wed to show roughly where the platform will run to once I get the ends fitted. Well, today has been very productive and I have now have DCC controlled points on the main line. 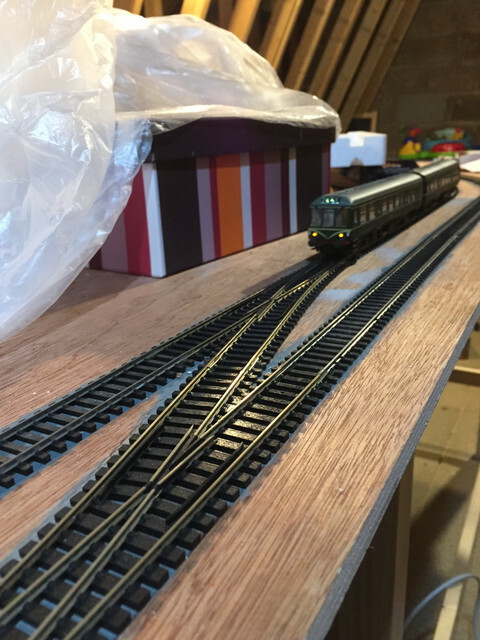 I still need to fit the motors to the sidings and wire them but to do so I will need to get another points decoder so for now I will need to content myself. In addition I also have giving the wiring under the layout a general tidy, it was starting to get rather messy! I spent some time earlier painting the rails and sleepers with a woodland scenics paint pen. It certainly makes a difference but I've no photos just yet, once I get the remaining parts done I'll get a photo or two. Not too sure how this fares against using a spray can to paint everything in one go, it gives more control, but I haven't done either before I cant compare. Scenery wise, I'm working on the tunnel but to be honest, until I get the lines all ballasted, there really is no need for it. I will need quite a bit of practice I think as again, I haven't done it before. I did manage to find the other Army vehicles I had in a box. They were made easily 10 years ago and the paint job isn't amazing so in en effort the hide that they have been weathered. Building models, wether it be from kits or scratch, isn't my strong point! I've also added to the fleet. 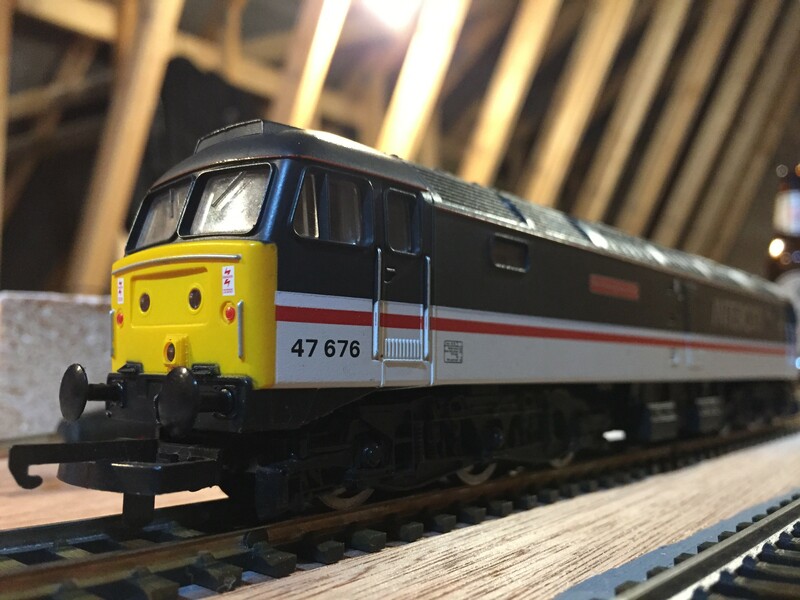 Picked up this class 47 for relatively little and converted it to DCC. It doesn't run just as well as it should but with the work on my layout recently there hasn't been rail cleaning going on and they are rather dirty, but a service wouldn't go a miss either. It will replace my non-running class 87 and haul the mk2 Intercity fleet as well as some mk3s if I don't get my 125 converted soon. 8vchris wrote: until I get the lines all ballasted, there really is no need for it. I will need quite a bit of practice I think as again, I haven't done it before. If it's any help I could lend you my ballast spreader. Literally fill it and push it along the track. Use a finger afterwards to get the ballast precise then glue down. thats a very kind offer, thanks, I will maybe take you up on that once I get to the ballasting stage. With one thing and another i haven't really been able to do much in the way of moving things on too much, although I have bought a few more vehicles etc. My other endeavour, and one of which I am particularly proud, is the tunnel has been started. 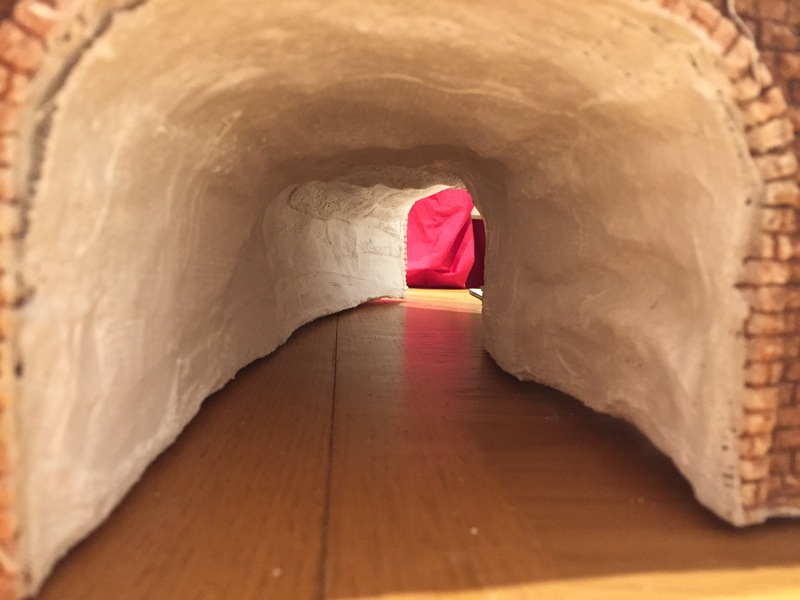 Using some foam insulation that was sandwiched together, I have created a tunnel that will run over the corner one the outer line at one end of the board. Its not terribly long so cleaning rails etc will be easy enough but also due to space, which is at a premium around the edges of the lines. 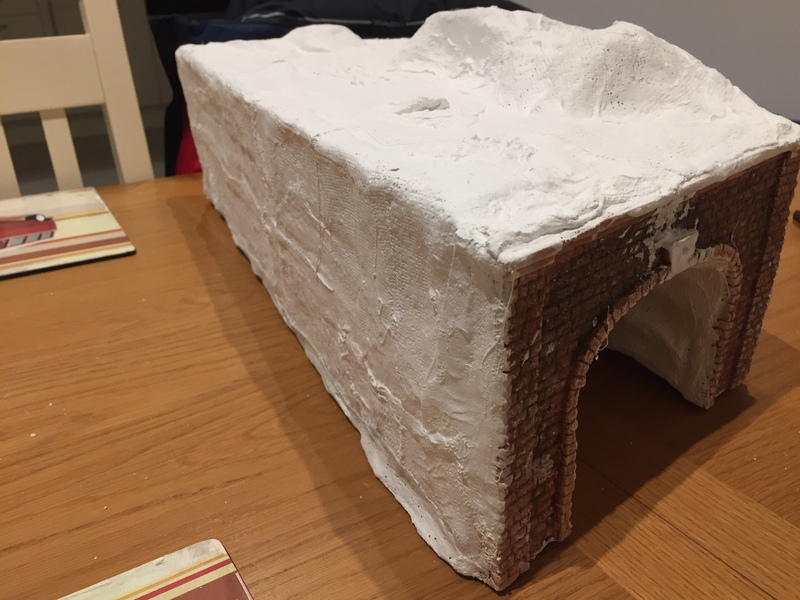 After some layers of plaster of paris and great patience it fits the gap nicely, and with the side cut in slightly at the bottom, the trains on the inner line can get past, only just, without clipping it. 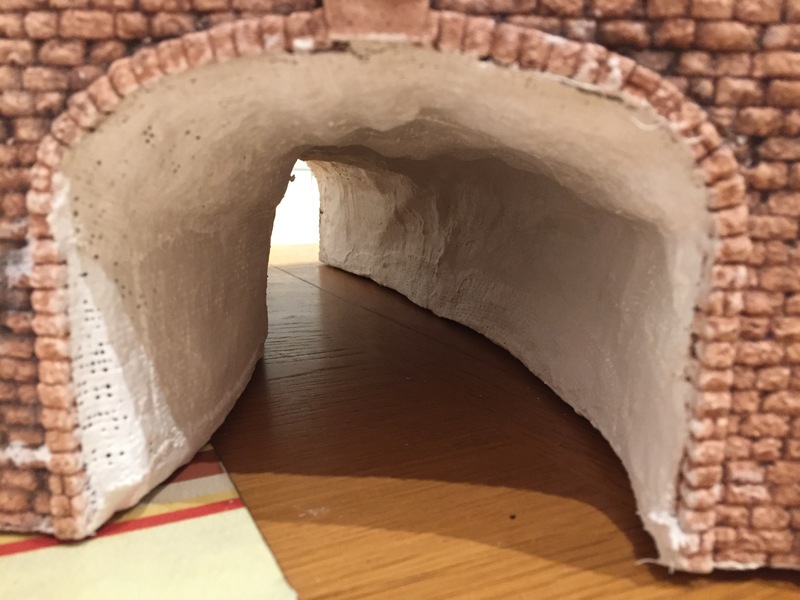 Not exactly what I had imagined, but who doesn't love a tunnel? Over the last few weeks has been relatively quiet, there hasn't been a huge amount going on aside from running trains. 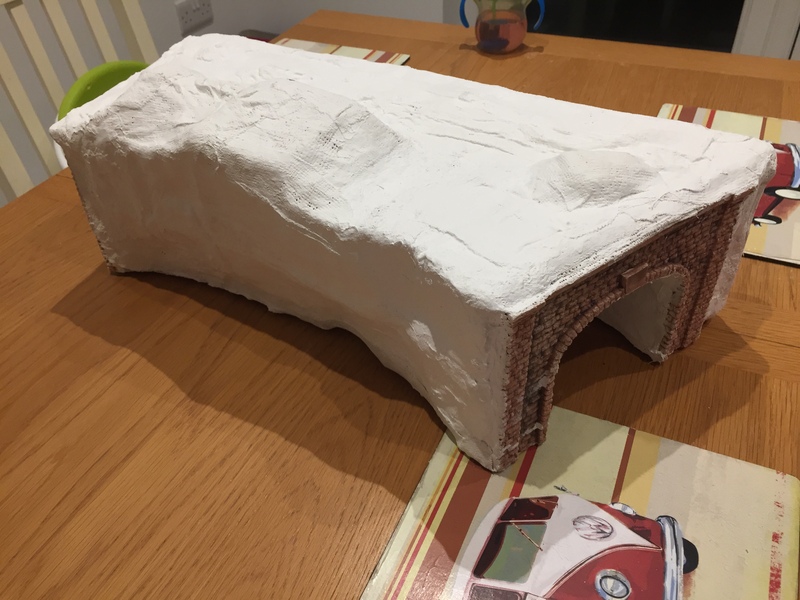 I've managed to get the tunnel painted up in grey before I get to the proper job of modelling it how I want it. It will have to wait for now as I want to get the green bits etc sorted and then start on the small village and station car park etc. In the mean time, I've been ballasting. Its very time consuming but it looks so much better for having done it. I've also painted the would be green areas an undercoat of green to try and give me some sort of base and to identify where needs looked at next. 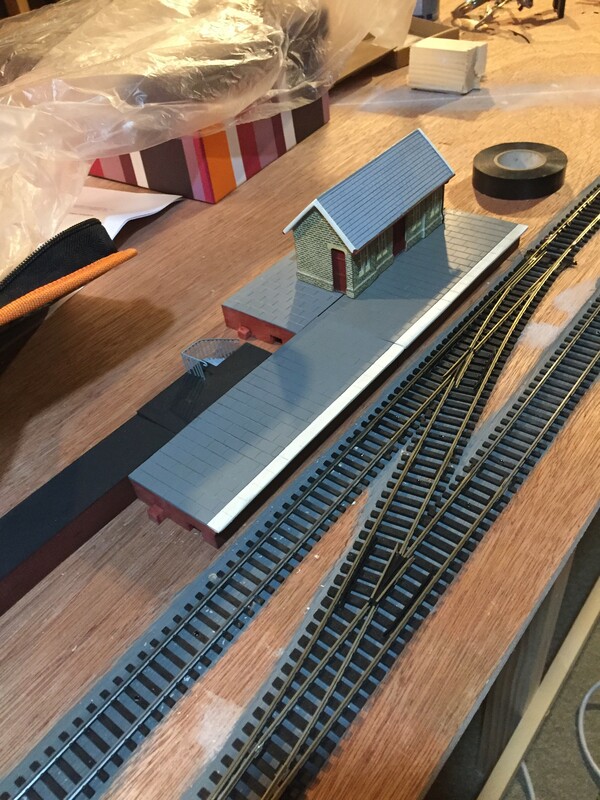 For ballast I have been using woodland scenics grey mixed medium with scenic cement to try and hold it all together. I realise i could make my own, and will likely do so when I need some more, but by buying it I now have have some storage containers for making up what I need. Theres also some stray ballast that needs tidied, can't have ballast lying on sleepers!